Perhaps the most common question that our first year guides ask is, "what kind of tent do you recommend?" I actually remember asking that very same question myself as I started my guide career and I subsequently made a big mistake. 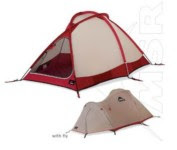 The first tent that I bought for guiding was a Mountain Hardwear Trango 2 which is a great tent. The thing is utterly bomb-proof, but clocks in at nearly ten pounds. Even when one splits such a tent with his partner, it is still a tremendously heavy piece of equipment. Unfortunately, as a guide you spend so much time in the field that you are often need to have your own tent for a little private time. During the summer season a guide's tent becomes a guide's home - a home that one carries by himself weighing almost ten pounds is an incredibly heavy abode. Every now and then I was lucky enough that our shop manager would let me borrow one of the one-man tents that we rent. I often borrowed the four season one man MSR Fury. 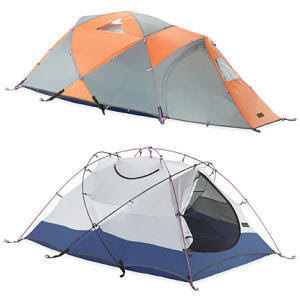 This extremely heavy-duty tent is no longer made as a solo tent. It now only comes in a two-person version. This is a good thing, because the door in the vestibule on the one-man version was nearly impossible to get in and out of. One had to contort his body in multiple strange ways in order to get in or out of the tent. Many guides chose to go with small two-man single-wall tents like the Black Diamond/Bibbler Ahwahnee or the Black Diamond Firstlight. Others are big fans of the solo double-wall Hilleberg Akto. I personally hate single-wall tents in the Cascades. They often leak after a few years of use. And the Hilleberg tents have a somewhat confusing system wherein the tent and the fly are permanently attached to one another. This system often requires additional time to figure out when you set it up. Eventually I decided that it was time to purchase a one-man tent of my own. I ended up with a very light option, but again something that wasn't terribly functional. I purchased a Mountain Hardwear Halcyon one-man tent. There were three problems with the Halcyon. First, the entire inside of the tent was made of mesh. This kept the inside of the tent cold and allowed muddy water to splash in from below the rainfly. Second, I wasn't able to sit-up inside the tent. It was too short. And third, the tent was not free-standing, which is a huge pain in the rear. Each of these problems were enough to make the tent worthless on their own, but together they made the tent less than worthless, they made the tent pure garbage. As such, I got rid of it and invested in a much cheaper but more functional one man tent. Approximately two years ago I bought a double-wall REI Chrysalis UL tent. This was a much warmer one man tent that allowed plenty of room for me to sit up inside. There wasn't very much mesh on the tent at all and it was completely freestanding. After all of my experimentation this was by far the best one-man tent that I encountered. The problem with this tent of course, is that they no longer make it. And indeed, they have not replaced it with anything similar. Unfortunately, it looks like when my tent wears out I'll have to start a new quest for another one-man tent that works. I picked up the two man Copper Spur from Six Moon. I don't yet have the funds to have my own two person for when I'm with a friend as well as a one man for when I'm alone. 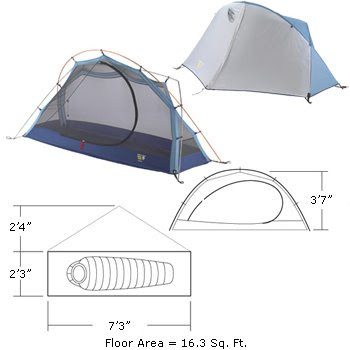 Then again, my tent weighs in at under 4lb, is tall enough for me to sit up with room to spare (I'm 5'7"ish), has sil-nylon about half way up before it becomes mesh, and while it can fit two, they need to be good friends. When I hit the AT this summer, that's the tent I'm planning on taking. Patagonia Trek & Climb Underway!